Korea | For the freedom of jailed korean trade unionists ! Free The Jailed Korean Trade Unionists NOW ! The former President Park Geun-hye and her government have been impeached for corruption and violating the democratic, human and labor rights of the Korean people. She and her cronies were paid off by union busting corporations like Samsung, Hanjin and others to allow company unions, to deregulate health and safety and to harass and intimidate democratic trade unionists. She also used mass repression to stop the Korean Rail Strike against privatization and has put many union leaders and rank and file trade unionists in jail. Korean Confederation of Trade Unions KCTU president Han Sang-gyun was sentenced by her corrupt judges to five years in July 2016 for supporting political organizing against the government. In December, Park Won-h, president of the KPTU-Truck Sol of the Korean public Service Division was also imprisoned. KCTU organising secretary Bae Tae-sun received an 18-month sentence with a 100,000 won fine. 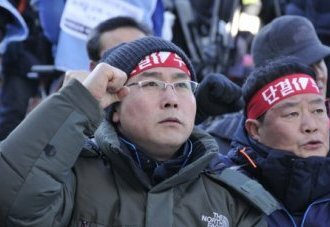 Railway trade unionists like Lee Jin Young have also been jailed to silence and intimidate workers. Public Workers and teachers have also been jailed for trying to form unions and the government is supporting the privatization of all public services while pushing militarization. While President Park Geun-hye and others in her government are in jail, the illegal jailing of workers and opponents of her government are still in jail as well. It is time to free all political prisoners and stop the continuing repression. The Park Geun-hye government also stepped up war moves with the construction of the Jeju military base and the installation of the US Thaad military weaponry despite mass opposition of the public and the KCTU. These war moves are a threat to democratic rights as well. Time To Stand Up For Democratic Labor Rights !